Kerry and Wayne shared their notes so that I could post them here. Below is the second of the stories, this one on a murder attempt that led to a marriage proposal. 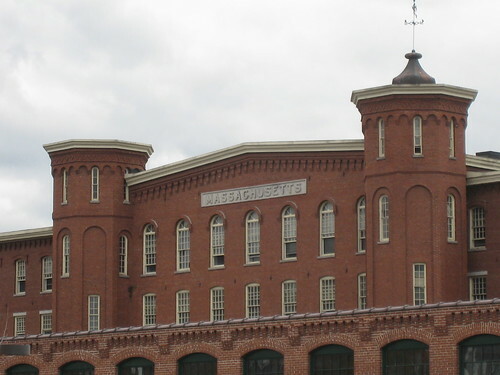 This story takes place in front of Massachusetts Mills, across Merrimack Street. We have talked about the power of the Lowell Sun to define a narrative. Back in 1896, the Lowell Sun First Edition’s top headline on February 26 read A REAL ROMANCE ENDS IN DOMESTIC LOVE AND HAPPINESS. That is pretty much the definition of burying the lede. The article talks about a couple named the Entwistles, and how they had recently returned to Lowell to enjoy married life at their house on Corbett Street, with Mr. Harry Entwistle working in the spinning room of Mass Mills. The full story is far less genteel. Harry Entwistle had met and started dating Maria Clegg in Lowell years earlier. In the summer of 1891, they had a lovers quarrel and Maria broke up with Harry. Harry became dejected and despondent about losing Maria, and then became a bit desperate. He was planning to take his own life in despair, but then on the night of October 7, 1891, he was coming out of the mill with a colleague and spotted Maria walking along the street with a friend. Harry came up behind her and without warning, shot her four or five times, with one of the bullets entering her lungs. She fell to the sidewalk, and in all of the chaos and confusion, Harry escaped. However, Harry was not quite as heartless as his crime might suggest. He had a good head start and he had made it all the way to the Wamesit Mills on the Concord River, but he became filled with remorse and walked back to the city center and turned himself in at the police station around midnight. Maria was in critical condition, but survived, while Harry was sentenced to 15 years in prison for his crime. The case gradually went out of the public’s consciousness until four years later, in April of 1895, when it was announced that Harry was being pardoned. Maria, it turns out, still carried a torch for Harry and had interceded on his behalf and requested a pardon. What finally secured the pardon, though, was that Harry bravely interceded in a riot at Charlestown Prison in March of 1893, saving the lives of prison officers. The couple were married right after Harry was released from prison, and after initially moving to England to live with Harry’s family, settled back in Lowell. When interviewed about her unusual love story, Mrs. Entwistle said, “My Married life has been as happy as I could wish. My husband is as kind and good as any woman could desire.” They remained married for the rest of their lives.